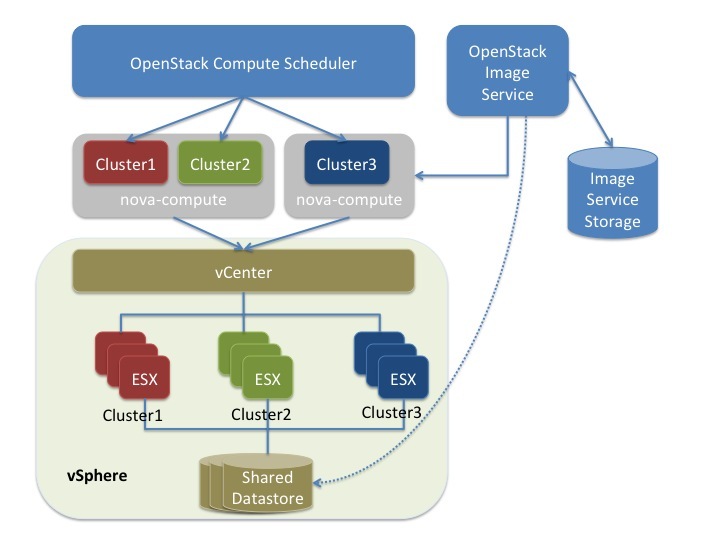 OpenStack Compute supports the VMware vSphere product family and enables access to advanced features such as vMotion, High Availability, and Dynamic Resource Scheduling (DRS). This section describes how to configure VMware-based virtual machine images for launch. vSphere versions 4.1 and later are supported. The VMware vCenter driver enables the nova-compute service to communicate with a VMware vCenter server that manages one or more ESX host clusters. The driver aggregates the ESX hosts in each cluster to present one large hypervisor entity for each cluster to the Compute scheduler. Because individual ESX hosts are not exposed to the scheduler, Compute schedules to the granularity of clusters and vCenter uses DRS to select the actual ESX host within the cluster. When a virtual machine makes its way into a vCenter cluster, it can use all vSphere features. The following sections describe how to configure the VMware vCenter driver. As the figure shows, the OpenStack Compute Scheduler sees three hypervisors that each correspond to a cluster in vCenter. Nova-compute contains the VMware driver. You can run with multiple nova-compute services. While Compute schedules at the granularity of a cluster, the VMware driver inside nova-compute interacts with the vCenter APIs to select an appropriate ESX host within the cluster. Internally, vCenter uses DRS for placement. The VMware vCenter driver also interacts with the OpenStack Image service to copy VMDK images from the Image service back-end store. The dotted line in the figure represents VMDK images being copied from the OpenStack Image service to the vSphere data store. VMDK images are cached in the data store so the copy operation is only required the first time that the VMDK image is used. After OpenStack boots a VM into a vSphere cluster, the VM becomes visible in vCenter and can access vSphere advanced features. At the same time, the VM is visible in the OpenStack dashboard and you can manage it as you would any other OpenStack VM. You can perform advanced vSphere operations in vCenter while you configure OpenStack resources such as VMs through the OpenStack dashboard. The figure does not show how networking fits into the architecture. Both nova-network and the OpenStack Networking Service are supported. For details, see the section called “Networking with VMware vSphere”. Configure vCenter. See the section called “Prerequisites and limitations”. Configure the VMware vCenter driver in the nova.conf file. See the section called “VMware vCenter driver”. Load desired VMDK images into the OpenStack Image Service. See the section called “Images with VMware vSphere”. Configure networking with either nova-network or the OpenStack Networking Service. See the section called “Networking with VMware vSphere”. Copying VMDK files (vSphere 5.1 only). In vSphere 5.1, copying large image files (for example, 12 GB and greater) from Glance can take a long time. To improve performance, VMware recommends that you upgrade to VMware vCenter Server 5.1 Update 1 or later. For more information, see the Release Notes. DRS. For any cluster that contains multiple ESX hosts, enable DRS and enable fully automated placement. Shared storage. Only shared storage is supported and data stores must be shared among all hosts in a cluster. It is recommended to remove data stores not intended for OpenStack from clusters being configured for OpenStack. Clusters and data stores. Do not use OpenStack clusters and data stores for other purposes. If you do, OpenStack displays incorrect usage information. Networking. The networking configuration depends on the desired networking model. See the section called “Networking with VMware vSphere”. Security groups. If you use the VMware driver with OpenStack Networking and the NSX plug-in, security groups are supported. If you use nova-network, security groups are not supported. The NSX plug-in is the only plug-in that is validated for vSphere. VNC. The port range 5900 - 6105 (inclusive) is automatically enabled for VNC connections on every ESX host in all clusters under OpenStack control. For more information about using a VNC client to connect to virtual machine, see http://kb.vmware.com/selfservice/microsites/search.do?language=en_US&cmd=displayKC&externalId=1246. In addition to the default VNC port numbers (5900 to 6000) specified in the above document, the following ports are also used: 6101, 6102, and 6105. You must modify the ESXi firewall configuration to allow the VNC ports. Additionally, for the firewall modifications to persist after a reboot, you must create a custom vSphere Installation Bundle (VIB) which is then installed onto the running ESXi host or added to a custom image profile used to install ESXi hosts. For details about how to create a VIB for persisting the firewall configuration modifications, see http://kb.vmware.com/selfservice/microsites/search.do?language=en_US&cmd=displayKC&externalId=2007381. The VIB can be downloaded from https://github.com/openstack-vmwareapi-team/Tools. To use multiple vCenter installations with OpenStack, each vCenter must be assigned to a separate availability zone. This is required as the OpenStack Block Storage VMDK driver does not currently work across multiple vCenter installations. OpenStack integration requires a vCenter service account with the following minimum permissions. Apply the permissions to the Datacenter root object, and select the Propagate to Child Objects option. vSphere vCenter versions 5.0 and earlier: You must specify the location of the WSDL files by adding the wsdl_location=http://127.0.0.1:8080/vmware/SDK/wsdl/vim25/vimService.wsdl setting to the above configuration. For more information, see vSphere 5.0 and earlier additional set up. Clusters: The vCenter driver can support multiple clusters. To use more than one cluster, simply add multiple cluster_name lines in nova.conf with the appropriate cluster name. Clusters and data stores used by the vCenter driver should not contain any VMs other than those created by the driver. Data stores: The datastore_regex setting specifies the data stores to use with Compute. For example, datastore_regex="nas. *" selects all the data stores that have a name starting with "nas". If this line is omitted, Compute uses the first data store returned by the vSphere API. It is recommended not to use this field and instead remove data stores that are not intended for OpenStack. Reserved host memory: The reserved_host_memory_mb option value is 512 MB by default. However, VMware recommends that you set this option to 0 MB because the vCenter driver reports the effective memory available to the virtual machines. The vCenter driver generates instance name by instance ID. Instance name template is ignored. A nova-compute service can control one or more clusters containing multiple ESX hosts, making nova-compute a critical service from a high availability perspective. Because the host that runs nova-compute can fail while the vCenter and ESX still run, you must protect the nova-compute service against host failures. Many nova.conf options are relevant to libvirt but do not apply to this driver. You must complete additional configuration for environments that use vSphere 5.0 and earlier. See the section called “vSphere 5.0 and earlier additional set up”. The vCenter driver supports images in the VMDK format. Disks in this format can be obtained from VMware Fusion or from an ESX environment. It is also possible to convert other formats, such as qcow2, to the VMDK format using the qemu-img utility. After a VMDK disk is available, load it into the OpenStack Image service. Then, you can use it with the VMware vCenter driver. The following sections provide additional details on the supported disks and the commands used for conversion and upload. VMFS Flat Disks (includes thin, thick, zeroedthick, and eagerzeroedthick). Note that once a VMFS thin disk is exported from VMFS to a non-VMFS location, like the OpenStack Image service, it becomes a preallocated flat disk. This impacts the transfer time from the OpenStack Image service to the data store when the full preallocated flat disk, rather than the thin disk, must be transferred. Monolithic Sparse disks. Sparse disks get imported from the OpenStack Image service into ESX as thin provisioned disks. Monolithic Sparse disks can be obtained from VMware Fusion or can be created by converting from other virtual disk formats using the qemu-img utility. Specifying thin does not provide any advantage over preallocated with the current version of the driver. Future versions might restore the thin properties of the disk after it is downloaded to a vSphere data store. Using the qemu-img utility, disk images in several formats (such as, qcow2) can be converted to the VMDK format. In a mixed hypervisor environment, OpenStack Compute uses the hypervisor_type tag to match images to the correct hypervisor type. For VMware images, set the hypervisor type to vmware. Other valid hypervisor types include: xen, qemu, lxc, uml, and hyperv. Note that qemu is used for both QEMU and KVM hypervisor types. Monolithic Sparse disks are considerably faster to download but have the overhead of an additional conversion step. When imported into ESX, sparse disks get converted to VMFS flat thin provisioned disks. The download and conversion steps only affect the first launched instance that uses the sparse disk image. The converted disk image is cached, so subsequent instances that use this disk image can simply use the cached version. To avoid the conversion step (at the cost of longer download times) consider converting sparse disks to thin provisioned or preallocated disks before loading them into the OpenStack Image service. Use one of the following tools to pre-convert sparse disks. Sometimes called the remote CLI or rCLI. Note that the vifs tool from the same CLI package can be used to upload the disk to be converted. The vifs tool can also be used to download the converted disk if necessary. The actual virtual disk data file converted-flat.vmdk. The file to be uploaded to the OpenStack Image Service is converted-flat.vmdk. The ESX hypervisor requires a copy of the VMDK file in order to boot up a virtual machine. As a result, the vCenter OpenStack Compute driver must download the VMDK via HTTP from the OpenStack Image service to a data store that is visible to the hypervisor. To optimize this process, the first time a VMDK file is used, it gets cached in the data store. A cached image is stored in a folder named after the image ID. Subsequent virtual machines that need the VMDK use the cached version and don't have to copy the file again from the OpenStack Image service. Even with a cached VMDK, there is still a copy operation from the cache location to the hypervisor file directory in the shared data store. To avoid this copy, boot the image in linked_clone mode. To learn how to enable this mode, see the section called “Configuration reference”. You can also use the vmware_linked_clone property in the OpenStack Image service to override the linked_clone mode on a per-image basis. If multiple compute nodes are running on the same host, or have a shared file system, you can enable them to use the same cache folder on the back-end data store. To configure this action, set the cache_prefix option in the nova.conf file. Its value stands for the name prefix of the folder where cached images are stored. This can take effect only if compute nodes are running on the same host, or have a shared file system. Set this option to True to specify that unused images should be removed after the duration specified in the remove_unused_original_minimum_age_seconds option. The default is True. Specifies the duration in seconds after which an unused image is purged from the cache. The default is 86400 (24 hours). The nova-network service with the FlatManager or FlatDHCPManager. Create a port group with the same name as the flat_network_bridge value in the nova.conf file. The default value is br100. If you specify another value, the new value must be a valid Linux bridge identifier that adheres to Linux bridge naming conventions. All VM NICs are attached to this port group. Ensure that the flat interface of the node that runs the nova-network service has a path to this network. When configuring the port binding for this port group in vCenter, specify ephemeral for the port binding type. For more information, see Choosing a port binding type in ESX/ESXi in the VMware Knowledge Base. The nova-network service with the VlanManager. Set the vlan_interface configuration option to match the ESX host interface that handles VLAN-tagged VM traffic. OpenStack Compute automatically creates the corresponding port groups. If you are using the OpenStack Networking Service: Before provisioning VMs, create a port group with the same name as the vmware.integration_bridge value in nova.conf (default is br-int). All VM NICs are attached to this port group for management by the OpenStack Networking plug-in. The VMware driver supports attaching volumes from the OpenStack Block Storage service. The VMware VMDK driver for OpenStack Block Storage is recommended and should be used for managing volumes based on vSphere data stores. For more information about the VMware VMDK driver, see VMware VMDK Driver. Also an iSCSI volume driver provides limited support and can be used only for attachments. Users of vSphere 5.0 or earlier must host their WSDL files locally. These steps are applicable for vCenter 5.0 or ESXi 5.0 and you can either mirror the WSDL from the vCenter or ESXi server that you intend to use or you can download the SDK directly from VMware. These workaround steps fix a known issue with the WSDL that was resolved in later versions. When setting the VMwareVCDriver configuration options, you must include the wsdl_location option. For more information, see VMwareVCDriver configuration options above. Use your OS-specific tools to install a command-line tool that can download files like wget. Because the reflect-types.xsd and reflect-messagetypes.xsd files do not fetch properly, you must stub out these files. Use the following XML listing to replace the missing file content. The XML parser underneath Python can be very particular and if you put a space in the wrong place, it can break the parser. Copy the following contents and formatting carefully. Alternatively, download the version appropriate SDK from http://www.vmware.com/support/developer/vc-sdk/ and copy it to the /opt/stack/vmware file. Make sure that the WSDL is available, in for example /opt/stack/vmware/SDK/wsdl/vim25/vimService.wsdl. You must point nova.conf to fetch this WSDL file from the local file system by using a URL. To customize the VMware driver, use the configuration option settings documented in Table 3.58, “Description of VMware configuration options”.